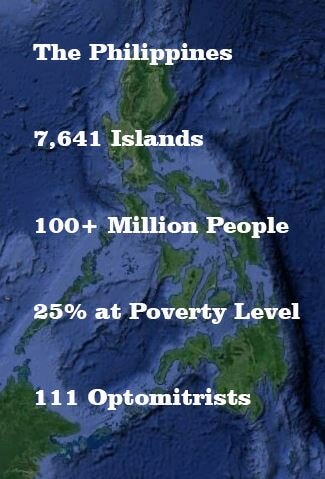 Providing Free quality eye care, including comprehensive eye examinations, glasses, medications and facilitate surgeries, to the poor people of the Philippines. The World Health Organization (W.H.O) states that 80% of blindness is preventable. W.H.O. lists "uncorrected refractive error" is the 2nd leading cause of blindness in the world, only after cataracts. This is where EyeCare WeCare Foundation is helping in a large way. We screen for Cataracts and our partners, Resources for the Blind, give free cataract surgeries. The Mobile Vision Clinic carries with it over 5000 pairs of graded recycled eyeglasses on every mission. Most can have a pair of eyeglasses in a matter of minutes following the examination. The Foundation wants to reach out to the poor people of the world and to restore their vision. The EyeCare WeCare Foundation appeals to Individuals, Civic, Religious, Fraternal Corporate organizations and other philanthropic foundations to contribute, to help reach more people. EYECARE WECARE Does more than provide EYE EXAMINATIONS, FREE EYEGLASSES & MEDICATIONS & IT FACILITATES FREE EYE SURGERY! (only during the medical missions). We are blessed to have local Filipino Doctors volunteering their skills to do the cataract surgeries and are happy to be able to give back to the poor in their communities. The surgeries are preformed by our partners, Resources for the Blind, The foundation often provides the surgery supplies and they provide the operating microscopes, volunteer doctors and the surgery venues. In recent years many of the patients needing cataract surgery have the expenses paid by the Philippine government with the Phil-Health Plan.